WEBCommentary(tm) - Obama Says "ICANN Transform the Internet." Obama Says "ICANN Transform the Internet." The USA invented the Internet and made it available to the World by creating ICANN (the Internet Corporation for Assigned Names & Numbers) to run the Internet in the American Way -- for Freedom of Speech, Religion, Association, Assembly and Petition. Now, in 2014, it appears that the Obama Administration is planning that commencing in 2015, the Internet will be run the "International" way -- so what would that portend? The USA invented the Internet and made it available to the World by creating ICANN (the Internet Corporation for Assigned Names & Numbers) to run the Internet in the American Way -- for Freedom of Speech, Religion, Association, Assembly and Petition. 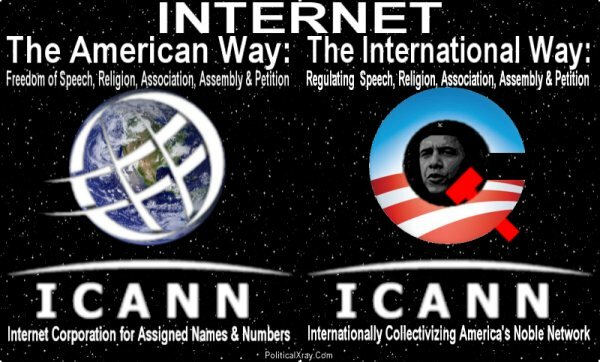 Now, in 2014, it appears that the Obama Administration is planning that commencing in 2015, the Internet will be run the "International" way, which will, undoubtedly include regulation off speech, religion, association, assembly and petition; stated differently, it will involve a NEW form of "ICANN," which will come to mean "Ideologically Counter-Americanizing the Net's Nature" or "Internationally Collectivizing America's Noble Network." Not a good thing for what JFK deemed the long twilight struggle seeking to assure the ultimate triumph of liberty over tyranny.